© 2004 Superfactory™. All Rights Reserved. 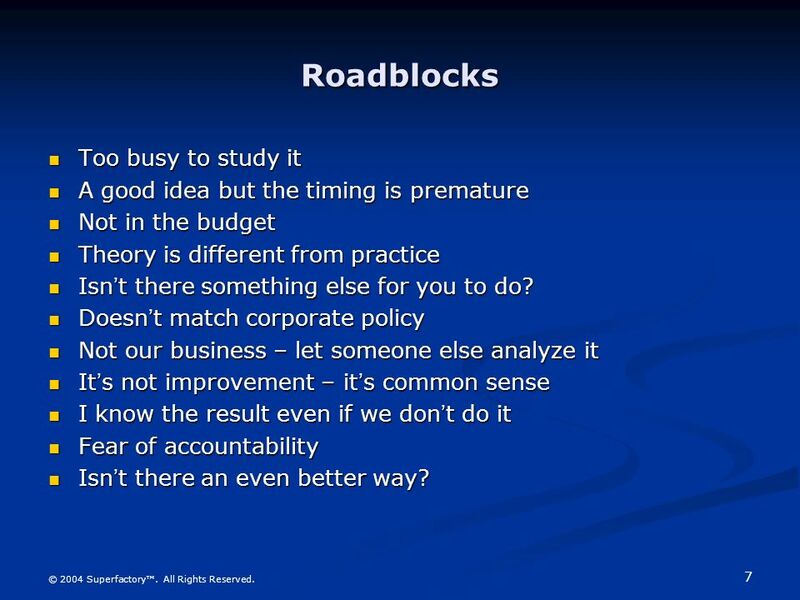 Roadblocks © 2004 Superfactory™. All Rights Reserved. “zen” means “good (for the better)” Gradual, orderly, and continuous improvement Ongoing improvement involving everyone © 2004 Superfactory™. All Rights Reserved. Pareto Charts Scatter Diagram Control Charts © 2004 Superfactory™. All Rights Reserved. 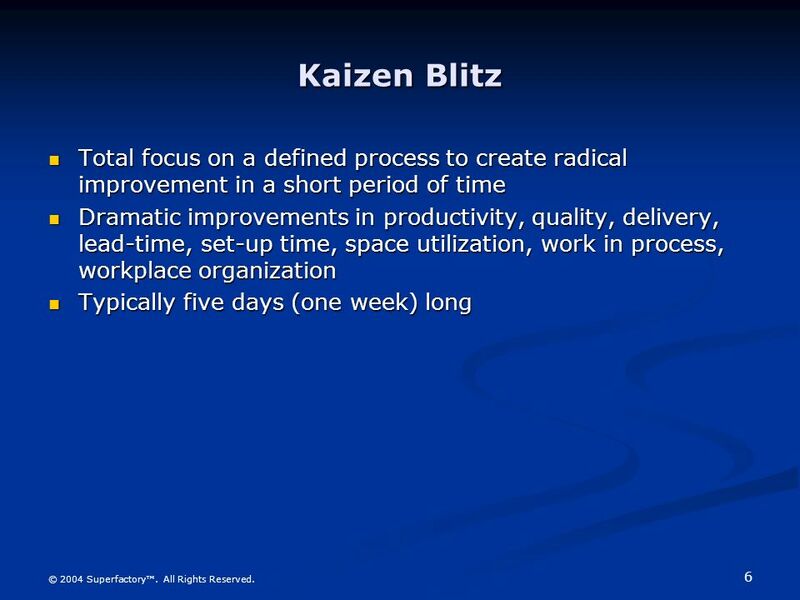 6 Kaizen Blitz Total focus on a defined process to create radical improvement in a short period of time Dramatic improvements in productivity, quality, delivery, lead-time, set-up time, space utilization, work in process, workplace organization Typically five days (one week) long © 2004 Superfactory™. All Rights Reserved. A good idea but the timing is premature Not in the budget Theory is different from practice Isn’t there something else for you to do? Doesn’t match corporate policy Not our business – let someone else analyze it It’s not improvement – it’s common sense I know the result even if we don’t do it Fear of accountability Isn’t there an even better way? © 2004 Superfactory™. All Rights Reserved. 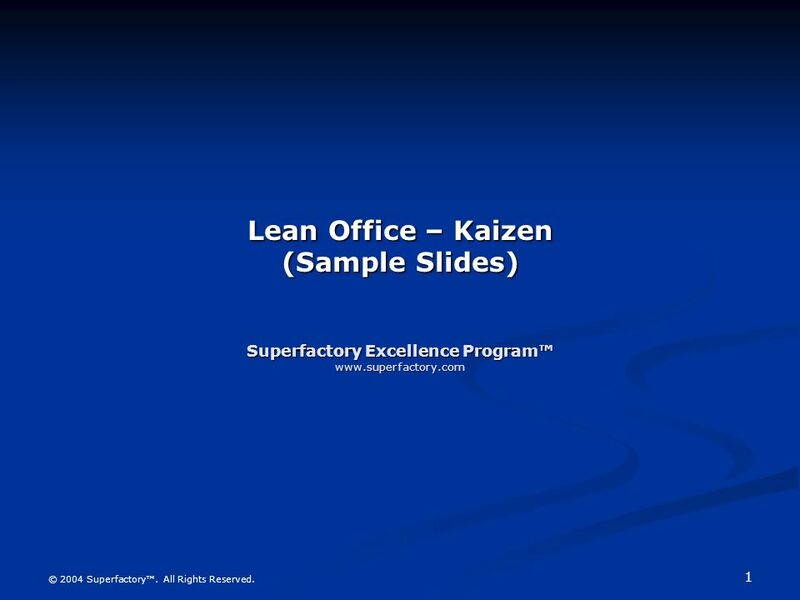 Download ppt "Lean Office – Kaizen (Sample Slides) Superfactory Excellence Program™"
The Continuous Improvement Classroom PDSA. Ground rules created by students Classroom mission statements Classroom and student measurable goals Quality. A day or not a day? The time it takes for the earth to revolve once on its axis. Which is 24 hours… What is a day? 1. 2 Class Questions on Organizational Issues with Kaizen The underlying mission for any organization is to enable work to occur that satisfies the customer. Continuous Improvement. 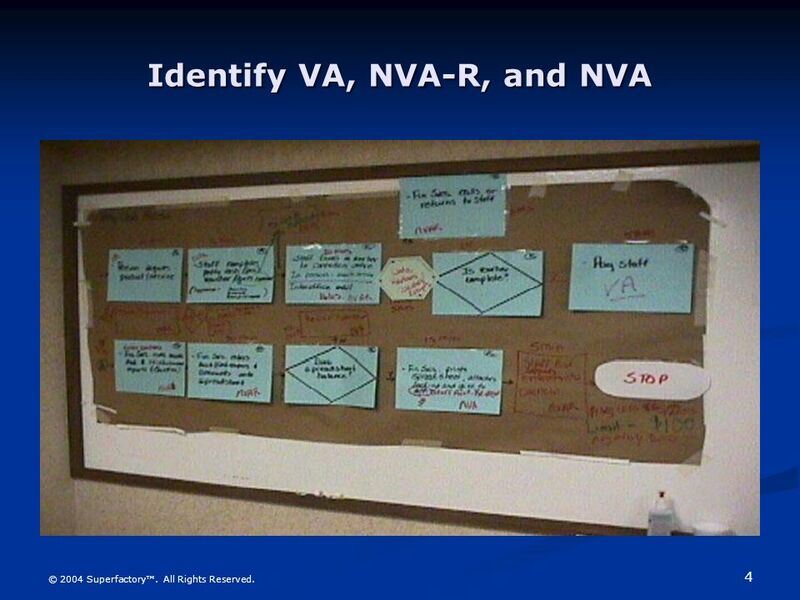 Ideas of CI Continually seeking ways to improve operations Not unique to quality – also applies to other process improvements. 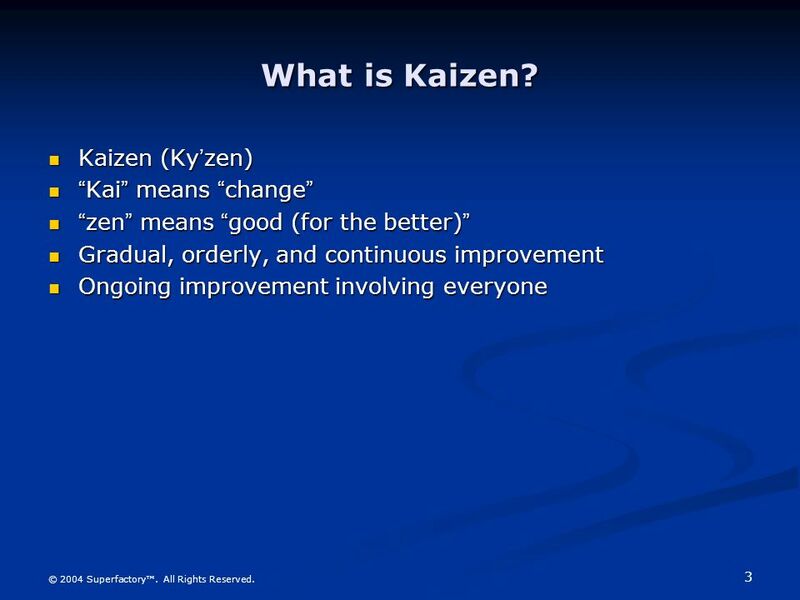 KAIZEN Kaizen is a Japanese quality improvement philosophy named after the phrase “continuous improvement.” Kaizen aims to create a quality oriented culture. 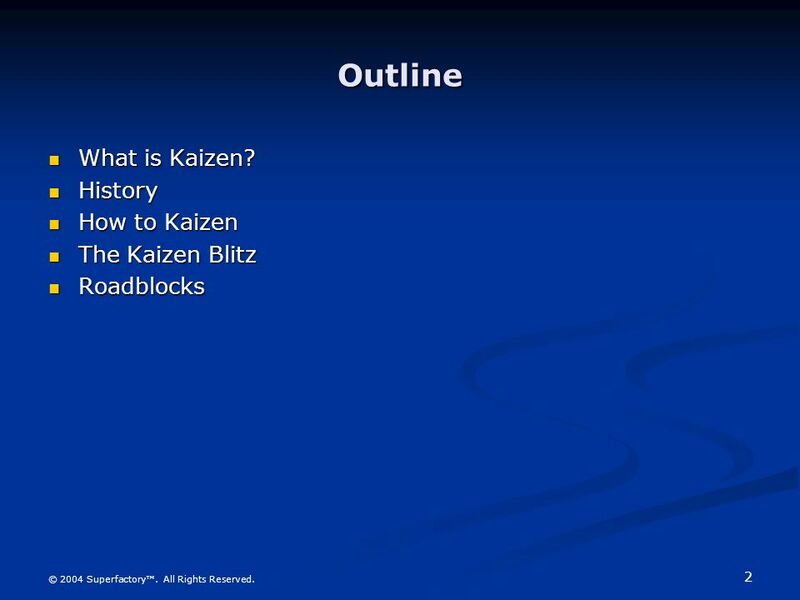 Kaizen – Just Do It! Kaizen means continuous improvement. Tools for Process Improvement Managing for Quality Dr. Tibben-Lembke. IE 673Session 6 - Process Improvement1 Process Improvement. 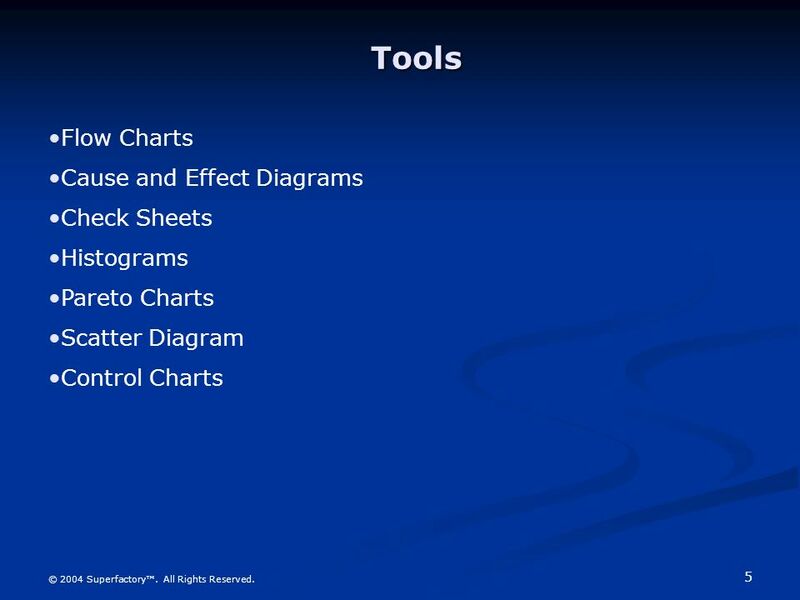 Total Quality Management BUS 3 – 142 Tools of Quality Week of Mar 7, 2011. Property of School District of Holmen Bridging the Gap through Continuous Improvement.  Board of Regents - University of Wisconsin Six Sigma in Higher Education: UW Administrative Process Redesign Project Scott Converse University of Wisconsin.